Paris Retail Week, the biggest 360° retail event in Europe, hosted the Paris Retail Awards at the end of day one, on 10th September. The competition unveiled and recognised some of the top innovations and projects in connected retailing. The winners were selected according to the following: innovation, efficacy and profitability. Each nominated company provided effective responses to issues faced by e-retailers, high-street retailers and brands more generally. For this year’s event, a new award was created for the "most promising newcomer", placing emphasis on companies that are helping to boost French prestige overseas. The Rookie of the Year Award was given by the public to the start-up with the biggest appeal. The highly anticipated ceremony was hosted by Céline Del Genes – Concept To Consumer Vice-President at Adidas HQ. The Jury, made up of 19 recognised professionals from the sector, was asked to select the most inspirational projects from 22 finalists announced last July. The 2018 selection focused on the most promising innovations in on- and off-line retailing in five categories: CRM - from a lead to the client, point-of-sale Digitalisation, 360° customer experience, logistics and technology. A jury prize, a winner of the winner’s prize and a French Initiative prize were also awarded, as well as a prize specifically for start-ups, as voted by the public. "The market is experiencing a dynamic period thanks to digital transformation and a wide range of new technological solutions. The jury appreciated the diversity of the competing projects, and the debates were fascinating. This energy is definitely reflected in the prize list at the Paris Retail Awards 2018!" "Retailers are aware of the new issues in their sector and the importance of taking on board solutions that are adapted to the market. This is why they are attentive to the innovations on offer all through the season, especially since they have the backing of the profession. The Paris Retail Awards are a part of this recognition approach, with the aim of providing a real guarantee of credibility,"
Winner:CAPITALDATA pour Tourist Tracker, solution de DriveToStore. The Rookie Of The Year Award is given to an outstanding young start-up and helps to highlight an innovative and promising concept. 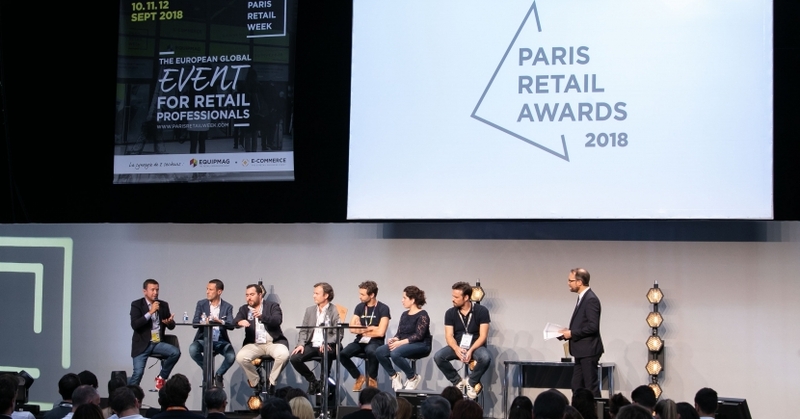 The three finalists, Mérito, Néos and Arcane, who were pre-selected by the jury, each pitched to the Paris Retail Awards audience, including professionals from connected retailing, potential customers and investors. Marion Oliveira, co-founder of Merito, explained how the platform pools employees between stores. This form of uberisation without insecurity means managers can access the right team at the right time. The Paris Retail Awards have seen the rise of small but promising French enterprises, such as Criteo and Hybris, enabling retail firms to boost brand awareness, to reward the efforts of all their teams, to launch new contracts, and even, as was the case for prize-winners in previous years, to raise new funds.